Court six in the High Court had a “festival atmosphere” this morning. This was according to one barrister, who, upon squeezing into the room at around 10.45am, was met with row upon row of filled seats. While pews are usually taken up by fellow counsel waiting to be assigned a slot for a hearing, today was different as civilians, many of them university students, filled up the room. 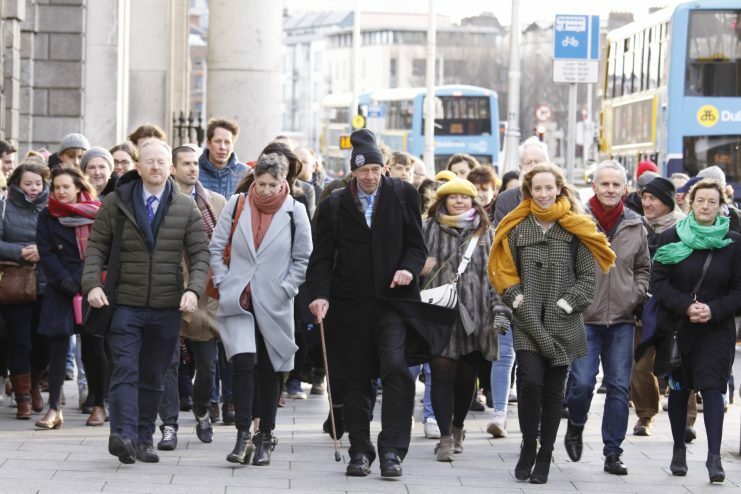 They were there for one thing and one thing only – to see the State in the dock over its climate record as the landmark Irish climate case brought by Friends of the Irish Environment kicked off today. The journalists in the room, this one included, were clearly impressed by the numbers present. They then all quickly made a beeline for the door as soon as Mr Justice Seamus Noonan listed the case for Court 29 knowing that they faced the rare case of competition for a seat. 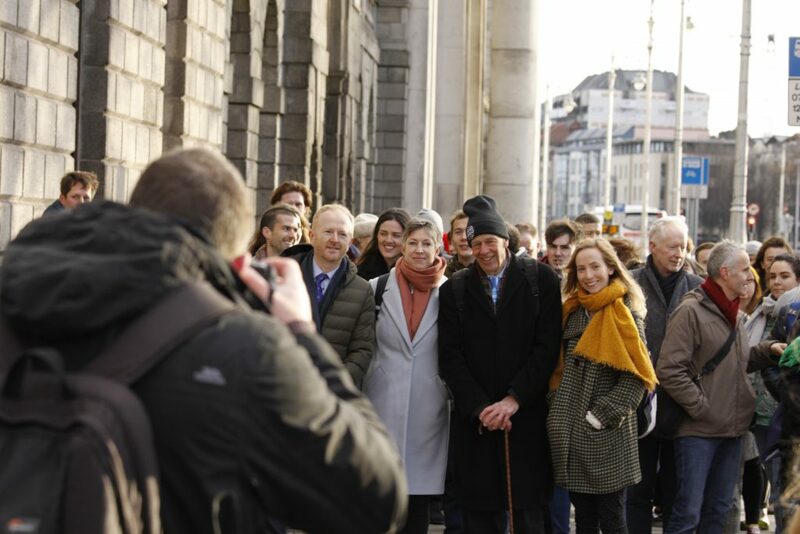 In the end, around 100 supporters of the case, both young and old, watched the proceedings, many standing or sitting on the floor for hours, listening attentively as FiE’s senior counsel outlined rising emissions, missed targets, and impending climate doom. The unprecedented level of climate devotees in the gallery is not surprising, however. The public is clearly fed up with the lack of progress from our State in tackling our growing emissions. This is reflected in the fact that a petition in favour of FiE’s position that the National Mitigation Plan is insufficient to tackle our rising emissions has over 15,000 signatures to date. And it is also little surprise that many of those who stuck around for the full day of deliberations were university students, as well as some secondary school students who joined the gathering in the afternoon. As climate case campaigner Clodagh Daly wrote in The Green News today, younger generations have developed an affinity with the case as they lack the legal and legislative power to push the Government to make decisions about their future. And the calls are increasing week-on-week. Only last weekend, hundreds of young protesters rallied in front of the Dáil calling on the Government to immediately address the growing threat of climate change. As 11-year-old Sadhbh Byrne said at the rally there is already a lot of responsibility put on children’s shoulders and, as such, they should “have a say in what’s happening”. “After all, it is our future,” she stressed. No matter what the High Court decides in this case, a change in policy will have to come sooner rather than later as support in the streets for climate action grows and the pressure mounts on Leinster House. Farming and climate: Do the solutions already exist?